Professional Beauty provides a range of high quality cosmetic surgery, dentistry and hair transplant surgery in Poland. At Professional Beauty they provide hair restoration treatment at competitive prices alongside high quality. Dr Marwan Saifi, has worked as a hair transplant surgeon in the USA since 1995. In December 2008 he started working in Poland and in 2011 he was awarded a prestigious and rarely awarded Diploma by the American Board of Hair Restoration Surgery. He is a member of the International Society of Hair Restoration Surgery. Consultations take place in Brussels. There is no charge and most British patients elect to have their consultation soon after arrival, the evening prior to obesity surgery in Brussels. A consultation in the UK can be arranged on request at the cost of £100 at one of the addresses listed below. The gastric band is made by 'Johnson & Johnson'. In order to support you in your weight loss, aftercare clinics offer advice, consultation and band refills to ensure that you remain on target to achieve your ideal weight. Refills cost £100 with the surgeon at the UK clinics and you are likely to require 4 in total, spanning one year. 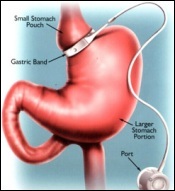 Gastric band surgery provided at the AZ Jan Portaels Hospital in Belgium. Dr De Bruyne is a member of the British General Medical Council. Consultations held in London. has fitted over 3,000 gastric bands.